Distraction has a face, and that face has black lips like a monkey’s, a mouth full of pearly snaggle teeth, and big, liquid eyes. Above those eyes hang long, delicate lashes that blend into a thatch of rakishly rumpled blond hair. 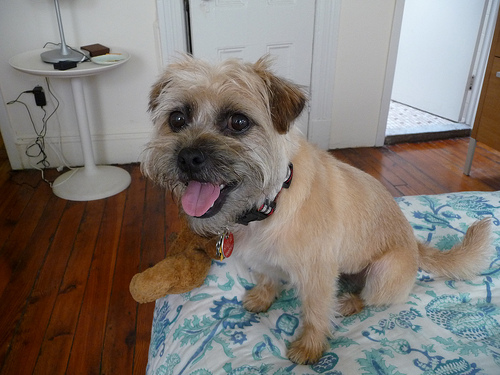 The face belongs to Mabel, a thirteen-pound, two-year-old Brussels Griffon/Border Terrier mix. She entered my life six months ago, like Lil Wayne entering St. Peter’s Basilica—with a presence disproportionate to her size and a youthful indifference to decorum. I’ve been meditating for fifteen years. I believe it’s made me a better person, though I’m vague on specifics. Perhaps the most tangible evidence of virtue I can offer is that when my wife and I decided to get a dog, we committed to adopting from an animal rescue. We found Mabel—Maple, as she was known before she met us—at a storefront shelter within walking distance of our Brooklyn home. 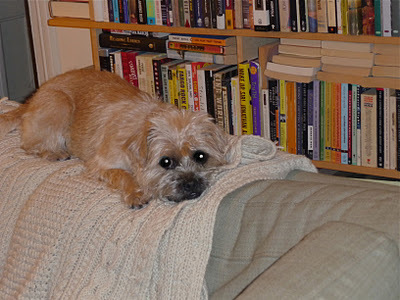 The moment she was carried up from the basement, amid a cacophony of barks and yips, we could sense she was our girl. Her fur was greasy and matted, giving her a feral look, but she was sweet with us and easygoing when I took her for a walk around the neighborhood. She waited calmly with me on the street while Lisa filled out the paperwork. At one point, a woman passed with a teensy spaniel in her arms, and Mabel (she was already Mabel to us) gave a menacing snarl. The shelter worker, a barrel of a guy, told us not to worry: the spaniel was mean; he rubbed all the rescue dogs the wrong way. In the course of our Googling, we’d seen Brussels Griffons referred to as “Velcro griffs”; sticking close to their people is a breed trait. Sure enough, once Mabel got used to her new situation, she was attached to us at the hip (or ankle, or neck, depending on whether we were sitting, standing, or lying down). It hadn’t occurred to me what this would mean for my meditation practice. Like most New Yorkers, Lisa and I live in a small apartment. Classic elements of a healthy marriage like “alone time” and “giving each other space” are hard to come by. I’d managed to carve out twenty minutes a day for sitting meditation (let’s hear it for right effort!) only because Lisa preferred to take a long shower before bed, leaving me the living room. Now, when I set my meditation cushion, or zafu, on the floor, there was a Velcro griff rattling around me, eager to assert ownership of all fabric-covered housewares, a Velcro griff for whom half-lotus position was an unambiguous invitation to plop down in Daddy’s lap and lick the food residue off his fingers. I moved to the couch, hoping to regain the high ground. Mabel followed. Used to meditating with open eyes, I thought if I closed them she might get the hint. Nope. Every time I snuck a peak—which, to my shame, was often—there she was, staring at me with a toothy grin. And as soon as our eyes met, her tail would start to wag and a low growl would gather in her throat—“a-rrrooo!”—the prelude to roughhousing. I couldn’t leave her alone in the bedroom while Lisa showered. We considered Mabel housebroken, but as any good Buddhist—or new dog owner—knows, identity is a construct, subject to change. In other words, accidents happen, especially when no one’s watching. There was also the matter of the laundry hamper, Mabel’s idea of a forbidden paradise. A single-minded griff can strew a lot of dirty underwear in twenty unsupervised minutes. I thought about crating her, but soft touch that I am, I couldn’t sentence her to solitary confinement while we were at home. So for those first few months with Mabel, my meditation practice went on hiatus. The irony: owning a dog made me realize like never before how much practice I need when it comes to calm abiding and loving kindness. Dogs have long been a bodhisattva’s best friend. Many Tibetan monks make breeding and caring for canine companions a regular part of their spiritual practice. The Lhasa Apso, long-haired darling of the kennel club circuit, started life as a monastery mascot and guard. In my hometown of West Palm Beach, the spiritual leader of the local dharma center, the late Venerable Khenchen Palden Sherab Rinpoche, was rarely seen without his tubby Pekingese, who would peep out from under the dais during ceremonies. But if being a dog owner and being a Buddhist go hand in hand, you wouldn’t have known it from me. Not only had I bailed on my meditation practice, but taking responsibility for Mabel’s well-being had turned me into a seething ball of stress and resentment. 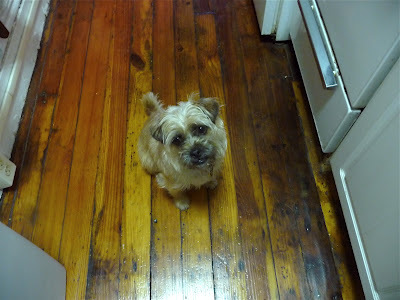 It turned out my scruffy friend, carefree and affectionate at home, was a stubborn, neurotic mess on the street. The shelter worker who had blamed Mabel’s snarling on that passing spaniel may have been channeling his inner used-car salesman. What Lisa and I soon discovered was that she was suspicious of most dogs and downright spooked by dogs her own size or smaller. She would stiffen as soon as she saw one approaching, and lunge when the offender came close enough for a sniff. The upshot was that I had to be on guard whenever I walked her. I got nervous as soon as I spotted another dog, which in my bustling neighborhood was typically within ten seconds of leaving the apartment. Once the inevitable happened and Mabel revealed her violent intentions, nerves gave way to embarrassment and embarrassment to anger. What business did my neighbors have letting their dogs out with no leash? Were they trying to show off how well behaved, how expertly trained their surrogate children were? Didn’t they realize they were provoking my special needs pooch? Couldn’t they tell she was a rescue? And what about those ignoramuses who let their clueless whelps trot right up to Mabel, tongues wagging? If they’d look up from their iPhones for half a second, they’d see me waving treats at my edgy gremlin, trying to block her line of sight, cooing sweet nothings an octave above my normal range, doing everything in my power to soothe or at least distract her inner beast. Didn’t their oblivious little Busters and Bandits deserve to get their throats gouged? That would teach them a lesson about stranger danger! Mabel’s fellow dogs were not her only bugaboo. On our usual evening walk, she might suddenly dig in her heels and refuse to go any farther until I changed our route. When the weather got chilly, we tried to suit her up in a puffy jacket, but we couldn’t even get her out the door in it. Worst of all was the rain. Mabel was sure to let us know how miserable even a light drizzle made her. No stiff upper lip for her. I’d seen other dogs rush to the nearest tree or wall to do their business and then hurry back indoors before they got drenched, but not Miss Mabel. When it came to relieving herself, she was a fussbudget, always seeking out the perfect conditions. On stormy nights, I’d drag her shivering around the block, knowing full well she was holding it in until she could steal a private moment at home. In the midst of one especially nasty downpour, I got caught pleading with Mabel and yanking on her leash as she staged an act of passive resistance. “I am not carrying you!” I whined, as our neighbor strolled up with his placid mutt India, both apparently indifferent to the rain. Of all the little lapdogs in the hood, India was Mabel’s most hated nemesis. This was not the first time her owner had witnessed my abject failure as a dog parent and all-around human being. “How’s it going with her?” he asked, coolly. “Uh, you know, work in progress,” I muttered, as Mabel bared her crooked fangs. “She’s a rescue, so…” “Yeah, India was a rescue, too,” he said, beaming down at her. “It just takes time.” I marched Mabel back to the apartment and slammed the door. Lisa’s head shot up from her book. Had an escaped mental patient with a drowned rat broken into her home? “God, I hate that jerk!” I said. I’d sunk to a new low. I didn’t hit rock bottom till Halloween night, a major event in my child-centric neck of the woods. I tried to steer Mabel clear of the parade and the shrill tween antics, worried that the noise and crowds would trigger a full-scale, spinning-in-place, tail-biting freak-out. I peered in the dark at all the discarded candy crushed underfoot, jerking the leash every time Mabel got the urge to scrounge. Hadn’t I read somewhere that chocolate was lethal poison to dogs? I calculated how long it would take me to run to the vet with a slack griff in my arms. By the time our walk was over, my pulse was racing and I was in a cold sweat. I couldn’t even remember if she’d peed. That’s when I knew I’d let this willful half-pint pull me off the eightfold path. I had to renew my commitment to my practice. A funny thing happened when I finally managed to settle down and get back on the cushion: slowly but surely, Mabel settled down with me. She still sidled up to me the instant I tucked my legs into position, but rather than resist her attention-grabbing antics, I just sat with them. Rather than spin off into frustration when she nibbled my mala beads, I just attended to my breath; rather than shove her away and turn my meditation session into a frenetic game of tag, I just smiled and returned to home base. Sure enough, Mabel eventually curled up beside me on her favorite pillow and relaxed. The next night, the same thing happened, a minute or two sooner this time. We had ourselves a new ritual. I came to think Mabel and I were meditating together. Sometimes, she would rest her head on my leg, and I would lightly drape my arm over her so I could feel the rise and fall of her breath as it synched up with mine. (I could hear it, too—Mabel’s breathing is indistinguishable from snoring at times.) Sharing this peaceful lull together softened my experience of being her caretaker. I thought I had understood what it meant to be interconnected, but seeing the effect of my own mindfulness on an instinct-driven being like Mabel made it all new again. Of course, the notion that dogs pick up on their owners’ cues was a revelation only to me. There is copious research demonstrating that dogs are keenly attuned to human body language and the emotions it conveys. By unconsciously tightening up on Mabel’s leash when I saw India coming, I was communicating my fear that she would lash out, sending it down the lead like it was a fiber optic cable. My fear, in turn, was stressing her out and triggering the very behavior I wanted to prevent. But now that I knew I was capable of being mindful in Mabel’s presence, I was ready to take the next step—literally. Our constitutionals became a form of walking meditation, an opportunity for me to remain open to experience, to break out of the good dog/bad dog mindset, accept each new encounter as it came, and respond—or not respond—as calmly and skillfully as I could. To be clear, I’m still annoyed by parents who see the sidewalk as their kids’ personal petting zoo, no need to ask permission first. And don’t get me started on litterbugs who think the curb is the perfect place to toss chicken bones. The difference now is that I try to keep a steady hand on the leash—not too tight, not too loose—and let the harsh feelings pass, without passing them on to my sensitive buddy. I think it’s paying off. Mabel seems less guarded on her walks now. When she doesn’t like the look of a passing dog, she is more likely to sit, watch me, and follow my lead. As we’ve worked on easing her aggressive tendencies, she’s even discovered a soft spot for old golden retrievers and will waltz right up to her favorite, Bogie, to say hello. I admit the improvement may have more to do with the fancy trainer we hired (she uses frozen French toast as treats!) and the diligence of our seen-it-all dog walker than any heightened consciousness on my part. Maybe Mabel is still influencing me more than I’m influencing her. Whatever, I’ll take it. The bottom line is that Mabel and I are connected, not just to each other but to Lisa and to our community. I’ve had some heartening conversations recently with neighbors who have noticed the progress we’re making and offered their help introducing Mabel to their dogs in a careful, considerate way. She still snarls and lunges sometimes when the vibe isn’t right, and she still makes meditation impossible every now and then, obsessively grooming her teddy bear or nosing her way under my shirt when calm abiding gets too boring. She’s still a dog, in other words, and I wouldn’t have it any other way. I’m getting more comfortable not always knowing what she’s going to do next, finding joy in guiding her, step by tiny step, down her path. If there are times we can’t sit together, no worries. We can always go for a walk. Posted in Essays and tagged Buddhism, Dogs, Meditation. Bookmark the permalink. Trackbacks are closed, but you can post a comment.